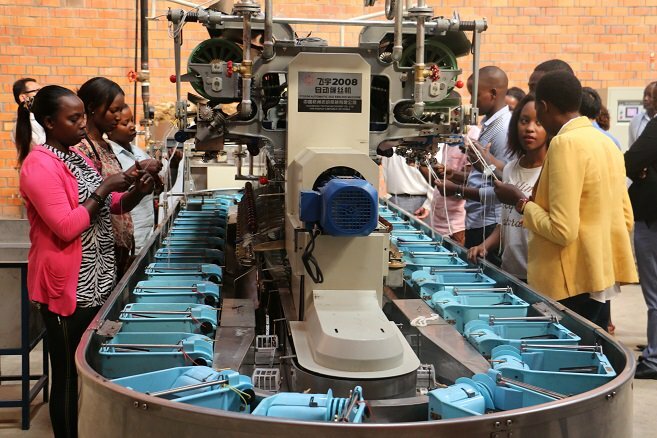 Workers reel silk filaments at the Rwanda Silk Processing Factory. Courtesy. 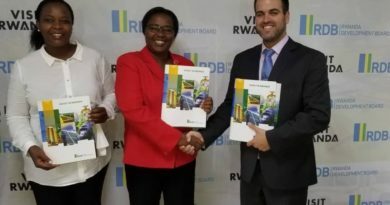 A new plant will be launched next month at the Kigali Special Economic Zone to spur Rwanda’s silk sector. It will be buying cocoons from farmers and making products to be exported. The factory will first produce silk sheets (materials used in making bed covers and suit jackets), as well as raw silk [yarn] needed for making clothes. This is expected to advance Rwanda’s silk sector according to sector players. Rwanda Silk Processing Factory is a result of a partnership between HEworks Rwanda Silk Ltd – a subsidiary of Korean firm HEworks, and the National Agriculture Exports Development Board (NAEB). In sericulture (the rearing of silk worms and mulberry plantations), silk worms feed on mulberry leaves and create series of single filaments that can be spun into long, luxurious yarn (spun thread used for knitting, weaving, or sewing). HEworks Rwanda Silk Ltd Managing Director, Seok-Weon Yoon told Sunday Times that by exporting silk products on the international market, the factory will contribute to the country’s export growth. “We are now in final test runs; we started with training of staff who will work in the factory. We currently have more than 30 factory workers who on a daily basis will do reeling, we are even expecting to recruit more,” he said. He disclosed that they expect to produce the first silk before the end of February 2019. He pointed out that in its initial operation this year, they will export 20 tonnes of which five will be raw silk while 15 will be sheet, which will generate $800,000. “We are planning to be able to export silk that will be over $100 million by 2025, thus our factory will solve the problem of balance of payments where the Country is always in deficit due to the fact that its import curve is always above its export curve,” Yoon said. Currently, he said, over Rwf776 million has been invested in the factory. “Our current targeted markets are Asian countries like Korea and Japan, but we have a potential market in European Countries like Italy which is known for production of high quality silk cloths. Jean Marie Vianney Munyaneza, Diversification and Product Development Manager at NAEB, said they expect the factory will have 36 permanent workers. 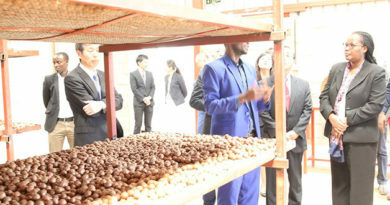 He added the factory can produce 70 to 100 tonnes of cocoons per year, pointing out that it means a lot in adding value to Rwanda’s sericulture produce. Munyaneza explained that given that silk yarn production is going down in countries such as India and China – which have been global leaders in this industry – partly because labour is expensive while the price rises as the demand still exists, there is huge opportunity in Rwanda’s silk industry. HEworks Rwanda Ltd sericulture Director, Keewook Sohn, looks at silk cocoons at a past agriculture expo at Mulindi Showgrounds. Emmanuel Ntirenganya. Declining production is resulting in high price for this luxurious textile material, as Munyaneza said the price of quality silk yarn has risen steadily from $50 per kilogramme in 2015/2016 and $80 currently. “Silk yarn market is expanding and promising such that prices trends suggest the market prices will continue to go higher over the next 50 years,” he said. He said that the price given to farmers for a kilogramme of cocoons is also going up in line with the market trend, as in 2015, was Rwf1,900 a kilogramme which has grown to Rwf3,450 for the first grade cocoons. “We already purchased land to build biggest factory which will export $350 million and create 6,000 jobs until 2030,” he revealed. Mulberry is currently grown on about 2,500 hectares in about 26 districts of Rwanda, with Gatsibo being the main producer. NAEB’s Munyaneza said that the country targets to have mulberry cultivation on 5,000 hectares by 2024, which can generate at least over 500 tonnes of cocoons per year. 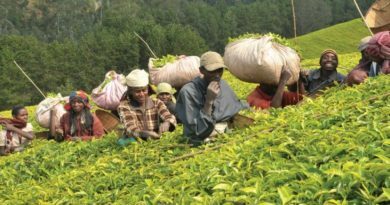 Statistics from NAEB show that Rwanda’s agricultural exports generated over $515.9 million (over Rwf447 billion) in a period of one year from July 2017 to June 2018, indicating an increase of 44.73 per cent compared to $356.5 million (over Rwf316.8 billion) generated in the same period in 2016-2017.